Potato and Master Q comin' at ya! The Skinny: Impressive computer animation aside, this hybrid live-action/animated comedy isn't much to write home about. It might be more fun for long-time fans of the comic strip Lo Fu Ji. The long in-production film version of the classic comic strip Lo Fu Ji finally arrives with all the pomp and circumstance of your usual Tsui Hark mega blockbuster. The big selling point here is not the pairing of white hot "It" kids Nicholas Tse and Cecilia Cheung, but the nifty computer animation used to bring Lo Fu Ji (or Master Q) and buddy Potato to life. The results are admirable. 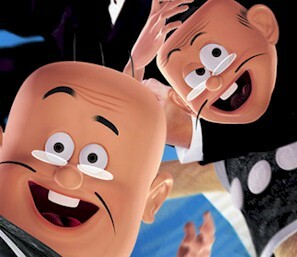 The computer models of Master Q, Potato and Mr. Chun look terrific and blend with the live-action footage decently. The whole thing isn't as polished as an American production, but that's to be expected with the obvious budget differences. Like the animated version of Chinese Ghost Story, what Tsui Hark and company have done here is impressive stuff. If only the movie matched up. It modernizes the Master Q formula by making the characters out of work, like old actors in need of new jobs. Then we get an out-of-nowhere plot about Fung (Nicholas Tse) and Miss Cheung (Cecilia Cheung), two young lovers who lose their memories thanks to Master Q and fumble around for ninety minutes until they get back together. Meanwhile, gangster Kam (Chan Wai-Man) tries to get on Fung's good side because he believes Fung will one day be Chief of Police. Miss Cheung hangs with Potato and Master Q until all the plot threads come together, which involves chases and musical numbers in a high school.